The proposal to open 90 percent of the nation's coastline – including the North Atlantic – to oil and gas exploration draws widespread opposition at an event held by federal officials in Augusta. 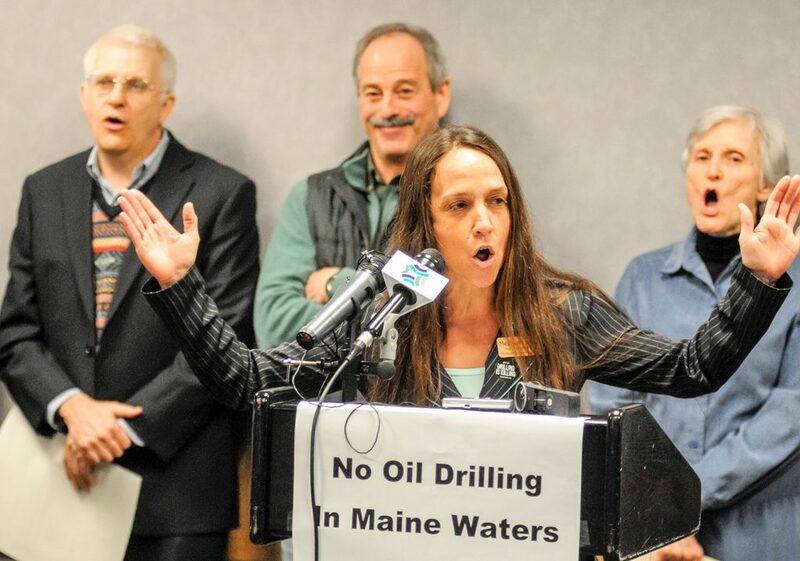 Melissa Gates, Northeast regional manager for the Surfrider Foundation, leads a chorus of “No!” after asking people at a news conference Wednesday if they support drilling for oil off the Maine coast. AUGUSTA — Fishermen, environmentalists and lawmakers from Maine’s coast called on the Trump administration Wednesday to exclude the North Atlantic from a plan to potentially reopen much of the nation’s coastline to oil and gas exploration. Representatives with the Department of the Interior’s Bureau of Ocean Energy Management were in Augusta for an open house-style event to field questions about President Trump’s controversial offshore energy proposal. The draft plan released in January calls for reopening 90 percent of the Atlantic and Pacific seaboards to oil and gas drilling, a seismic shift from the 6 percent now available to energy companies. The public comment period on the draft plan closes Friday. Just two of the 47 proposed lease sales would be in the North Atlantic region stretching from Maine to New Jersey. But the mere prospect of oil drilling in the Gulf of Maine or Georges Bank – and the accompanying environmental risks – was enough to draw more than 60 people to a pre-emptive event held before the bureau’s open house. 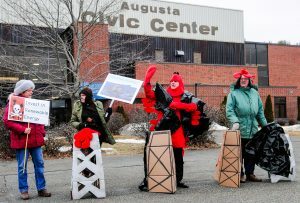 Four protesters stand outside the Augusta Civic Center on Wednesday during the event held by the Bureau of Ocean Energy Management. Kristan Porter, a fisherman from Cutler who is president of the Maine Lobstermen’s Association, recalled how one of his predecessors told Congress in 1970 that Maine fishermen were “100 percent against” allowing oil drilling in the Gulf of Maine. Nearly 50 years later, Porter said, nothing has changed. Porter was joined at the event by representatives of the Natural Resources Council of Maine and other environmental groups, the aquaculture industry, tourism advocates, and Democratic, Republican and independent politicians. All four members of Maine’s congressional delegation also oppose the plan. The Bureau of Ocean Energy Management event at the Augusta Civic Center was one of roughly two dozen similar “open houses” nationwide where the public could view videos and posters about the issue and speak with the bureau’s staff. This is the first step in a three-stage process that precedes any energy exploration and development lease sales. By year’s end, Interior Secretary Ryan Zinke will unveil a more refined plan – along with a draft “environmental impact statement” – that is expected to narrow the areas where oil and gas drilling would be allowed. The Bureau of Ocean Energy Management will then hold additional public meetings before Zinke finalizes the lease sale plan by the end of 2019. L. Renee Orr, chief of the bureau’s Office of Strategic Resources, said open houses are intended to help the public frame their comments to inform Zinke as he prepares a final plan. By law, Zinke must balance eight factors when developing the next five-year energy plan, including an area’s geology, environmental and marine sensitivity, competing uses of the ocean, state laws and the nation’s energy needs. The bureau conducted similar open house-style meetings during development of the last five-year plan, under President Obama in 2015. And during the first hour of Wednesday’s four-hour event, dozens of people (most of whom attended the pre-emptive news conference) circulated and talked casually with agency experts at each station. 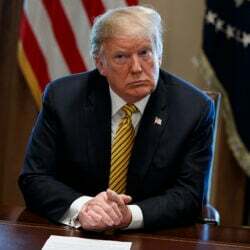 But some saw the lack of a formal public hearing as a way to discourage critical feedback while others expressed skepticism that Zinke or Trump will seriously weigh comments from the public or even agency scientists. Sara Staples of Cumberland also was unhappy with Wednesday’s format. Every Republican and Democratic governor along the Eastern seaboard – with the exception of Maine’s Gov. Paul LePage – has spoken out against the plan. LePage has yet to take a formal position on the issue, but the Republican has expressed support for exploring energy opportunities in the North Atlantic with the expectation that some areas will be excluded for environmental and economic reasons. Most other prominent politicians in Maine – on all sides of the political spectrum – oppose oil and gas drilling in the North Atlantic. 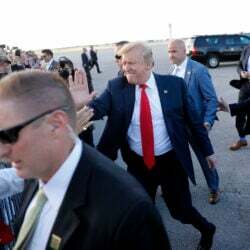 All four members of Maine’s congressional delegation – Republican Sen. Susan Collins, independent Sen. Angus King, Republican Rep. Bruce Poliquin and Democratic Rep. Chellie Pingree – have come out strongly against the plan. Both chambers of the Legislature unanimously approved a resolution this month requesting Maine’s removal from the plan. “The Maine Legislature is sending the strongest possible signal we can to President Trump and Secretary Zinke that the state of Maine is not interested in offshore drilling,” said Rep. Mick Devin, D-Newcastle, sponsor of the resolution. A national report issued Wednesday by the conservation group Oceana estimated that Maine’s coastal tourism, fishing and recreation industries support more than 54,000 jobs and generate $2.7 billion in gross domestic product annually. But the report estimates that all of the “economically recoverable” fossil fuel reserves located off the coast of Maine would only supply 10 days of oil and eight days of gas at the nation’s current consumption rates. Even if Maine’s offshore waters remain in the Trump administration plan, it appears unlikely that much energy exploration will happen off the state’s coastline. The Interior Department’s own inventory of areas likely to have recoverable oil and gas resources indicates that the interior of the Gulf of Maine has no geologically promising areas. Instead, exploration activities appear more likely to focus on areas to the south and southeast of Georges Bank. But some Maine fishermen making their living plying the waters of George’s Bank, and even those who work closer to home worry that the North Atlantic’s powerful currents could mean that pollution from an oil spill hundreds of miles away eventually makes its way to Maine’s coastal fisheries. Public comments can be submitted online through the Bureau of Ocean Energy Management’s website at www.boem.gov.